How will you Ride the Year of the Horse? On 31st January we are entering the Chinese Year of the Horse. Horses are a symbol of travelling and success. Horses like to compete with others. They pursue freedom, passion and leadership. 2014 is likely to be busy for you if you have goals, but if you allow yourself to be directionless, you will lose yourself. Horses are sociable and like to show off. They are also image conscious, vain and connected to love and romance. Horse energy is intelligent but also wild and therefore self-discipline is key for 2014. Horses also carry the element of fire so embrace your creativity but beware your hot temper and lack of patience. Dividing time up into animal years is a way of describing energy. Energy follows thought. If you spend your time thinking of what you haven’t got then this will be your future. If, however, you can find the courage to mount the horse and gallop with joy in your heart, then you will create something far more positive. Energy also manifests in experience. Most of us shut ourselves down to experience to avoid being hurt. Dare to embrace energy in a more creative way. The ride might or might not be dangerous but it will definitely be thrilling. Horses are wild and we do not have a right to their co-operation. Rather than breaking their spirit, we would be better to whisper them towards us gently and with compassion so that any partnership we have with them is based on trust. Then the ride will be one of mutual benefit with the horse seeking not to throw us off but rather to move smoothly under us as though we are one. 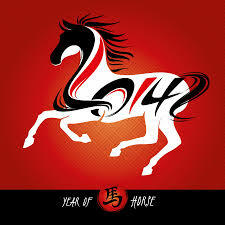 The Year of the Horse promises to be a dramatic journey full of opportunity for those of us brave enough to take the ride. It helps when we have a stable footing from which to climb on the back of the horse. Try stating ten things you are grateful for before you get out of bed in the morning. Bless your food before you eat it so you align your body with its energy to enable better digestion. Go to sleep with thoughts of appreciation rather than self-criticism to set yourself up for a positive next day. Use the energy of the horse with a sense of curiosity and fun. It will make you stronger and help you to shift your thoughts so you can create a more positive future both for yourself and others. Sending you love and blessings for 2014. Here’s hoping that you have the ride of your life!